Hydroquinone is a compound that can block the creation of melanin in our skin. Melanin is what creates color tone in human skin. When there is an excess of melanin production, we end up with darker or discolored skin. This is why hydroquinone creams are one of the most popular solutions to skin issues like hyperpigmentation, melasma, pigmented scars, freckles, liver spots, sun spots, dark spots or age spots. 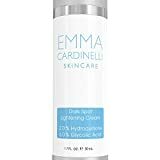 Since there are a lot of anti-pigmentation and bleaching products out there, we decided to help you find the best hydroquinone cream over the counter for your skin by reviewing 10 top selling Amazon products, with positive reviews. Along with Ammoniated Mercury, Hydroquinone is a skin bleaching ingredient that can be found on FDA’s official list of over-the-counter drugs. By law, all over-the-counter (otc) hydroquinone creams in the USA have a 2% hydroquinone concentration and results can be seen after 8-12 weeks of use. Higher concentrations of hydroquinone need a medical prescription. Be wary of otc hydroquinone creams with hydroquinone concentration higher than 2%, as they may pose a risk to your health. Prescription hydroquinone creams usually have 4% concentration, promising results in about 4-8 weeks. Do OTC Hydroquinone Creams Work? Scientific studies and customer reviews show that otc hydroquinone creams work, but they require constant use for 8-12 weeks. Seek a dermatologist’s advice if you want a higher concentration of hydroquinone for faster results. An important aspect to keep in mind, however, is that hydroquinone creams cannot be used for more than 1 to 3 months. After this period, you should switch to a simple whitening cream made with natural ingredients. Also, remember that sunlight stimulates the production of melanin, so you should always wear sunscreen in the morning and a wide-bream hat to protect your skin! That being said, here are our choices for the best hydroquinone cream over the counter that are definitely worth a try! If you suffer from conditions like melasma or freckles, this cream is specifically designed for you. It is a night cream, and daily application can see results within a matter of weeks. Hydroquinone is the single key ingredient in this cream from Melloderm. Since this is an OTC medication, the intensity of the hydroquinone has been kept lower, at 2%. Even at that potency, this cream is not a great option if you have hypersensitive skin. Hydroquinone creams like these are also not suitable for skin areas with sunburns. If your skin is sensitive from the use of hair-removal treatments, you should not apply this cream. How to Use: Apply every night on clean skin, on the affected area. The product should not be used for longer than 3 months. This is a general skin lightening cream aimed at women who want lighter skin tones. It has a potent bleaching effect, due to the presence of 2% hydroquinone in the formula. 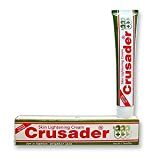 Along with the active ingredient, this Crusader cream also contains a special compound called Escalol 507. This is a powerful sunscreen, and its inclusion in a skin whitening cream makes perfect sense. Now, when you wear this cream, not only does it reduce the melanin in your skin, it also ensures that sun exposure doesn’t reverse its effects, for visible results within weeks of regular use. Contraindications: Do not use the product for more than 3 months. Not recommended for children. How to Use: Wash the affected area with soap, then apply the cream in the morning and at night. QUALITY - 2% Hydroquinone, 6% Glycolic Acid and Lactic Acid, B-White Peptide, Vitamin E, Licorice Extract and Niacinamide helps even skin tone, brighten and diminish unwanted discoloration. RESULTS - Fade stubborn dark spots, freckles, hyperpigmentation and melasma while refining and hydrating the surface of skin. OTC skin lightener can be used up to twice daily. FACE, HANDS, NECK, PLUS MORE - Multi-purpose dark spot corrector can be used for external areas of the body including underarms, elbows, knees, intimate areas, and more. Refer to product label for daily use. DUAL ALPHA HYDROXY ACID - Glycolic Acid and Lactic Acid helps resurface the skin through exfoliation, helping to remove dirt, oil and impurities while boosting the effectiveness of the Hydroquinone treatment. See images for instructions. CONTAINS THE HIGHEST concentration of hydroquinone allowed without a prescription - use for 4 weeks to visibly notice dark spots have faded. Use once or twice per day or as directed by a doctor. Unlike the two products that we have reviewed so far on our list of the best hydroquinone cream over the counter brands, Divine Derriere does not depend on a single active ingredient. This is still a 2% hydroquinone cream, but the formula also contains 6% glycolic acid and lactic acid. There are peptides and herbal extracts in it as well. They all combine to ensure a potent whitening and lightening effect on your skin. If you have dark spots, freckles, or melasma anywhere on your body, or if you suffer from hyper-pigmentation, the Divine Derriere cream is the perfect antidote. The cream is available in a special vacuum airless jar, with a very sophisticated delivery system. Indications: Treatment of freckles, dark spots, hyperpigmentation and melasma. Can be applied on face, neck, and body. Contraindications: Do not use the product for more than 3 months. Not recommended for children under 12 or pregnant women. How to Use: Apply twice daily, once in the morning and once in the evening on the concerned area. Limit sun exposure, wear sunscreen (at least SPF 30) during the day. This is a typical bleaching cream for your skin, armed with the melatonin killing power of hydroquinone. If you have issues related to uneven complexion or blemishes on your skin, this cream is a good choice. It does not contain any other major ingredients. The sole active ingredient is hydroquinone, available in a moderate strength of 2%. This cream is available in a simple tube and packaging, with minimal marketing gimmicks. It is a made-in-USA product, and has a reliable whitening action on your skin. As long as you don’t suffer from hypersensitivity or injuries in the affected area, this is a safe hydroquinone cream that lightens and brightens your skin. Contraindications: Do not use the product for more than 3 months. How to Use: Apply once a day, in the evening, before going to sleep. For better results, exfoliate before applying. If you feel like the 2% strength creams are not going to take care of your discoloration issues, this ultra-strong cream from Clinicians Complex might be what you need. It has 6% active ingredient strength, even if hydroquinone is still at 2%. The inclusion of kojic acid and bearberry extracts at 2% potency each ensures a stronger cream. All three are proven agents that can help lighten your complexion. This cream is perfect for removing sun spots and age spots. It also does a great job of removing melasma, freckles, and pigmented scars. For maximum results, you should apply it twice on a daily basis in addition to wearing sunscreen SPF 30 or higher every day. How to Use: Apply twice a day (evening and morning) on clean skin. Wearing at least SPF 30 every day is mandatory. LIGHTENS DARK SPOTS & BLEMISHES - reduce the look of age spots, freckles, and blotches for youthful, revitalized skin. EVENS BLOTCHY SKIN TONE - Glycolic Acid penetrates deep to fade sun spots and birth marks, creating a light, even skin tone. FAST ACTING TREATMENT - begin seeing results in just a few weeks with regular application. Skin lightening cream with fast results. SOFTENS SKIN TEXTURE - improves and softens skin with the clinically proven non-irritating formula for comfortable skin whitening. REFRESHING MANGO SCENT - the light texture and revitalizing scent make this lightening cream comfortable for both everyday use & as a skin bleaching cream. This cream claims to be the strongest non-prescription OTC skin lightening treatment, despite only containing the bog standard 2% hydroquinone potency. So, how do they manage to stay above the competition? This is probably due to the inclusion of 6% glycolic acid, along with vitamins. They help reduce discoloration and hyperpigmentation, and can effectively remove age spots, sun spots, freckles, and melasma. This is a cream that can be applied every day, at night, for effective results; you can expect the discoloration to disappear in a matter of weeks. It is safe for use on face, neck, chest, but also on armpits, back, knees, elbows, inner thighs, and sensitive private areas. Contraindications: Do not use under eyes, on eyelids or lips. How to Use: For the first week, use once a day, in the evening. During the second week, increase to twice daily. Exfoliate and cleanse thoroughly before applying the cream, for better results. Limit sun exposure and wear SPF. This is a capable, dual-action cream from Esoterica, with moisturizing and skin tone lightening effects. If you suffer from uneven complexion, blemishes, dark areas or freckles, this is a great option, with a palpable hydrating effect. Thanks to the moisturization this cream offers, it can be a great option if you also suffer from excessively dry skin. Since it is light and nongreasy, it can also be used under your regular makeup. This is a potent night cream that can be applied all over your body, depending on where your need its impact the most. 2% hydroquinone is the main active ingredient. Contraindications: Do not use if pregnant or breastfeeding, on children under 12, or on irritated or broken skin. Avoid contact with eyes. How to Use: Apply to the affected area twice daily, for up to 3 months. For better results, use moisturizer, limit sun exposure and wear SPF. 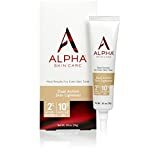 If you are unsure about which skin lightening cream to use for your particular skin type, then Alpha Hydrox is the best hydroquinone cream over the counter for you. It is the best hydroquinone cream over the counter suitable for all skin types, including regular, dry, oily, and combination. Along with 2% hydroquinone, this cream also contains 10% glycolic acid, which gives it more potency than some of the other creams we have reviewed here. For a healing and rejuvenating effect, this anti-wrinkle cream also contains Vitamin E and moisturizers. It can boost collagen levels in your skin, helping it retain its youthful vigor. Contraindications: Do not use on children under 12, or on irritated skin. Avoid contact with eyes. How to Use: Apply to the affected area twice daily, for up to 3 months. Limit sun exposure and wear SPF while using the product and for one week afterward. Professionally formulated with multiple effective ingredients that provide synergetic effects - ensure you get the best results, visibly fade/remove age spots/brown spots, freckles, sun spots, acne scars, uneven skin tone, or you will get your money back for the product within 45 days, Hassle-Free return policy! Results from consumer trials found: 80% of users saw fewer dark spots in just 6 weeks. Made in USA, guaranteed Quality. This is a potent cream for melasma and hyperpigmentation, with the focused impact of three proven ingredients. Along with hydroquinone, it contains kojic acid and glycolic acid, to remove melanin and lighten your skin. As if that was not enough, this serum also incorporates into its formula herbal extracts like licorice and mulberry, to boost its nourishing effects on your skin. As this is an OTC medication, the serum contains only 2% hydroquinone. It works extremely well at removing freckles, melasma, age spots, acne scars, and uneven skin tone. Contraindications: Perform a skin test before using. Avoid contact with eyes. How to Use: Apply a thin layer of serum over the affected area, once a day, at night. Increase the amount gradually, as your skin gets used to the serum. Light peeling and mild redness can be experienced during the treatment, and are considered normal. Avoid sun exposure and wear SPF during the treatment. CONSIDERED TO BE MORE effective than other hydroquinone products and melasma treatment creams: the directions on the outer box says "use twice daily or as directed by doctor"
Admire My Skin lives up to its promise of eliminating imperfections like dark spots and freckles. That is why it earns the title of the best hydroquinone cream over the counter. Like all other creams on this list, this one too contains 2% hydroquinone, in compliance with US FDA rules for OTC creams. This is a night cream that can deliver results within four weeks of regular use. Along with hydroquinone, this melasma treatment fade cream also contains salicylic acid, azelaic acid, lactic acid, and Vitamin C. This combination of ingredients provides a potent action against dark spots, melasma, hyperpigmentation, fine lines, and wrinkles. Contraindications: Perform a skin test before using. Avoid contact with eyes. Do not use the product for more than 60 days, after which you will need a 30-day break. Do not use on children under 12, around the eye area or on irritated skin. How to Use: Apply a thin layer of serum over the affected area, once or twice a day. Limit sun exposure and always wear SPF during the treatment. The best hydroquinone cream over the counter can only contain 2% of the active ingredient, as per rules and regulations. So, the best products try to add more active ingredients like glycolic acid to boost the effect of hydroquinone on your skin. Do you like hydroquinone, or are you worried about its side effects on hypersensitive skin? Let us know your thoughts in the comments section below. Don’t forget to also share with us your pick of the best hydroquinone cream over the counter.